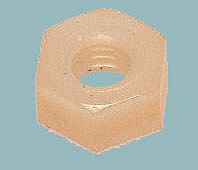 The lists below show our range of plain, nyloc and nylon nuts in Metric and BA threads. We also stock a small range of UNF nuts to suit many popular aero-engine prop shafts. We also stock steel M2, M3, M4, M5 and M6 nyloc nuts in black finish. If you were looking for Aerotight, Dome, Flanged or Wing nuts, please click here. Click on the images to go direct to each item list. Images are indicative only and exact forms may vary. Click on any of the images to be taken to the 'Special Nuts' page. All our metric nuts are standard pitch (metric coarse) as below unless stated otherwise.